The announcement of a new theme park, at Walt Disney World and around the globe, is a promise for the future and a hope of what might be. This euphoric state was never more present than at the announcement of EPCOT Center, the first Disney theme park to diverge from the Disneyland model. That declaration was made by Disney President and CEO Card Walker in late 1978 to the delegates of the 26th World Congress of the International Chamber of Commerce. The October 6, 1978 issue of Eyes and Ears covered the story. “EPCOT Center will consist of two major themed areas: Future World and the World Showcase. The first of these will dramatize the history and future challenges of the critical problems facing us today - providing a window onto the worlds of energy, transportation, the seas, space, life & health and other subjects. 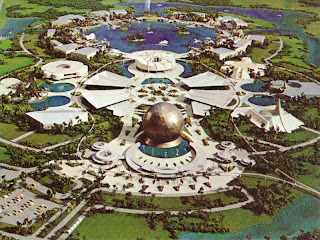 Future World will also include a global marketplace of new ideas which we call the Communicore. In this communications core of EPCOT Center industry and the public will participate in a ‘hands-on’ exchange of new and exciting systems, products and technology. “The World Showcase will be a community of nations, the only permanent international exposition of its kind anywhere, focusing on the culture, traditions, tourism and accomplishments of people around the world. A model for true people to people exchange, the World Showcase will offer participating nations an opportunity to send their outstanding young adults to operate the attractions, shops, restaurants and exhibits of their pavilions. And these young people who will work, play and learn together for a period of up to one year will help to generate greater international understanding. “EPCOT Center has already received an exciting response and considerable support from American as well as international interests. As of now, Walt Disney Productions has received letters of intent or contracts from four of the world’s largest corporations for participation in EPCOT Center’s Future World. General Motors will present Transportation. Exxon Company, U.S.A. will present Energy. Kraft, Inc. will present The Land. In addition, a major presentation is now being designed for American Telephone & Telegraph Co.